The Pedigree Calf Fair @ Beef N.I. 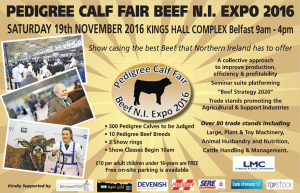 Expo will be held at the RUAS Balmoral Showgrouds, Belfast on Saturday 19th November 2016 commencing at 10am. This premier show, being the first of its kind in Ireland will showcase the premium quality pedigree calves in Northern Ireland, demonstrating excellence in breeding and the calibre for the future. Beef Strategy 2020, also the first in Ireland, will be the forum for discussion at Beef N.I. Expo which will offer the chance to discuss the future of Beef farming and best practice with Processors, Retailers, Breeders and all stake-holders concerned with and dedicated to improving the Beef sector for the future…..given the difficulties facing the sector, this is something not to miss.